The Motion Math team posted a thoughtful behind-the-scenes expo on their latest game, Hungry Guppy. PayPal-cofounder Peter Thiel ran a seminar at Stanford last quarter called “Startups,” which I couldn’t find room for in my schedule. Blake Masters summarized each class, though, and not in the usual disjointed live-tweeting style, but with well-edited narratives. Chris Hill’s Guide for a Mentor Teacher. Thirty great points. Scott McLeod has likely seen more reactionary stances against Internet access in schools than anybody, which makes his 26 Internet Safety Talking Points the authoritative piece. I subscribed to Jeff Brenneman as part of Sam Shah’s freshman class of math ed bloggers and was rewarded with his list of advice For the Interns and the First-Years. I’ll sign off on each item, especially in hindsight of having broken each of them. The judges’ prize goes to Michael Pershan’s What if Khan Academy was Made in Japan?, followed by Kate Nowak’s critique of Khan Academy’s lecture on the coordinate plane, and then to Susan Jones’ faithful homage to MST3K’s talking robots. Dr. Tae’s sharp critique of Khan Academy’s enthusiasm for gamification won the People’s Choice Award. Each one is worth your while but special merits, again, to Pershan’s video which is optimistic, constructive, and exhaustively researched. He edits himself extremely well throughout the video, maintaining this unflagging narration that’s almost Ze Frankian. 13 minutes pass by in an instant. You should watch it, then subscribe to his blog, then follow him on Twitter, then visit him at his home. Of course, the real winners of the competition are everyone who looked critically at Khan Academy (and looked critically at its critics) and developed a more nuanced view. If after reading some of the conversation generated about Khan Academy this summer, you have a stronger position that Khan Academy is [completely awesome/situationally useful/seriously problematic] then I’m pleased to have played a tiny role in nudging the conversation. My preference would be that you’d watch the 8.5 minutes from 19:14 to 27:57 of this video. 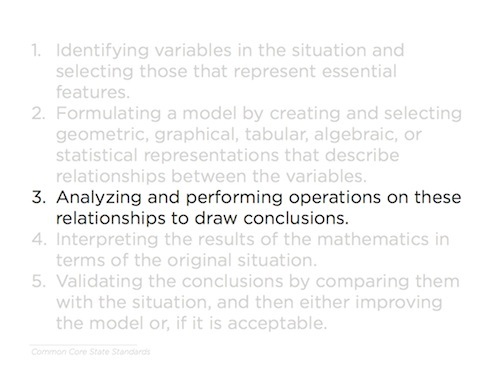 Some of the examples don’t work well here in text, but I’m going to lay out the slides and narration anyway so we have a place to argue about this segment in specific. This gets really fun here. This is a part I’m really enthusiastic about right now. 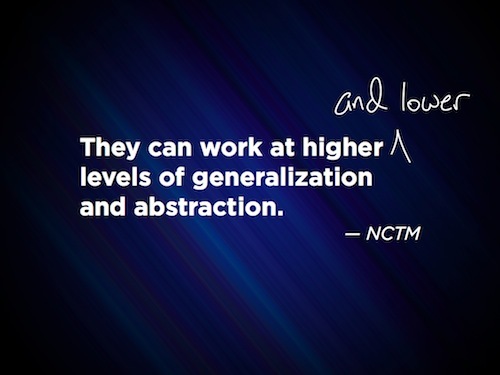 Have students climb the entire ladder of abstraction. This is NCTM on technology and I think they got it exactly half right. The technology helps us work at higher levels of abstraction but technology also helps us work at lower levels of abstraction. Right now, the tasks we give students are focused on this narrow band, this narrow set of rungs in the middle of that ladder and no higher and no lower. You look at the modeling standard and look at what it says. (This terrifies me by the way.) 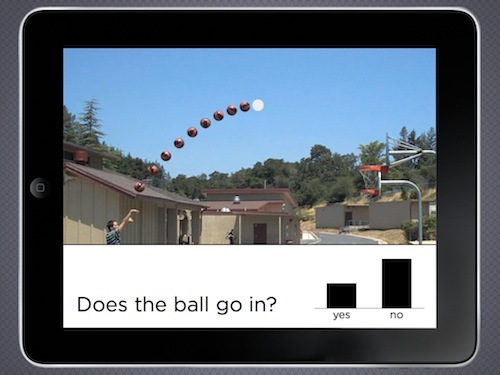 “Identifying variables. Formulating a model. Analyzing and performing operations. Interpreting the results. 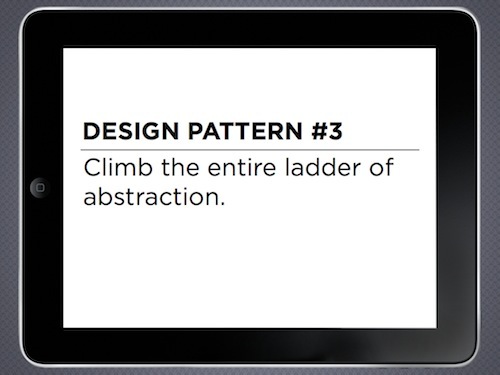 Validating the conclusions.” That’s your ladder of abstraction there. [I won’t exactly sign on off that now, FWIW, but let’s see where he’s going with this. –dm] And what do we have students doing? Just that middle rung. They select the operation and apply it. That’s it. And so this is a tool that was built by a guy named Bret Victor. This is a guy you should get to know. I watched a talk he gave on the plane over here from San Francisco and I had like a physical reaction to this talk it was that good. He has a project called Kill Math, which should be provocative enough for all of you guys to click on the link. He’s a technologist, a creator, an artist, an engineer. This is a guy who will provoke your thinking in a number of different ways. But he created this tool he calls Tangle and I adapted it for use in this problem. 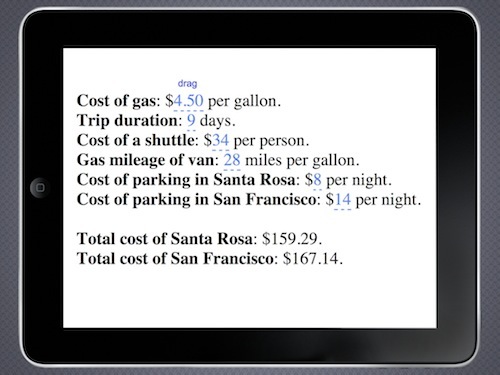 And what it lets me do is essentially turn all those parameters into variables and so now once I’ve solved the first problem, I can slide around on all those things and see what would happen if gas dropped in price or if the shuttle costs went up or if the cost of parking in Santa Rosa dropped to zero. And ask a whole host of new, different, complicated questions. And pose scenarios that are higher up on the ladder of abstraction. But we also need to have students work at lower levels. Like, where did those parameters come from? You and me. We brainstormed them [earlier in the session –dm]. But in the textbook those are given to them. 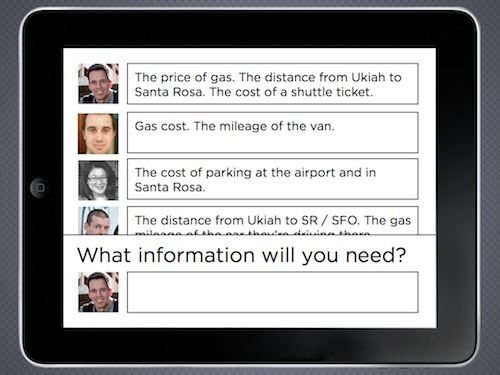 The text tells students what parameters they’re going to need and it gives them that information. Thats a valuable lower rung on the ladder that students need experience with. 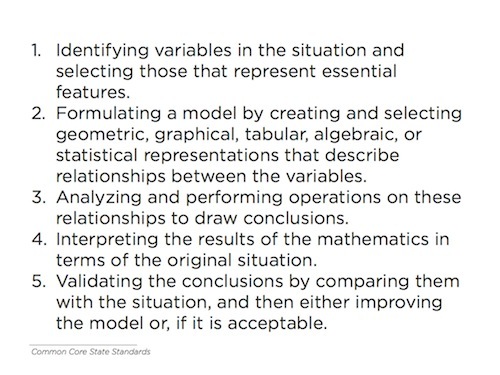 Once we have the task posed, let’s just ask that student, “What information will you need here?” And just let the student think about it for a second, and then type a few things down in a low-risk environment. And maybe let the student see all the classmates’ responses also, the results of that brainstorming. That’s a lower level of abstraction. 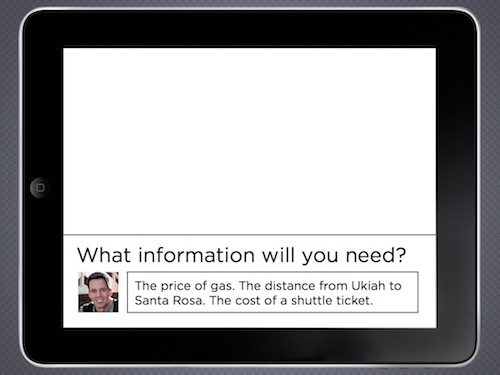 You and I are constantly dealing with the question, “What information do I need to solve this task?” That’s a question that gets very little air time in our print-based curricula. Again, we have a third page for this problem now. We have the starter — the context, the visual. We have this rung — this level of abstraction. And then the rest of the problem. That’s three pages for this task right now. You can’t do it in print. We could compress all of those. But you can’t put a kid on a higher rung and then ask them to work on a lower one. Like I can’t give the kid all the information they’ll need and then ask them “what information will you need?” The horse is out of the barn. So we have to split this up over multiple “pages”. Go even lower. This is, I think, the lowest rung on the ladder of abstraction. We show. We don’t tell. And then we pose the task immediately, “Does the ball go in?” And, at this point, how are you not speculating? Like how are you not guessing. I know you have a theory. You’ve got an idea in your head whether it’s going in or not. Can I get you guys to raise a hand if you think it’s going in? Okay. And the rest think it’s going out. I’ll just assume that. That is a valuable moment of intuitive and guesswork and it’s engaging for students so let’s give them an outlet for that on the page there. Just let them tap a yes or a no. “What do you think?” And then we’ll aggregate all those responses. This has cost us nothing in terms of cash or weight on the student’s back. It’s cost us a brief second of class time, which makes whatever meager return we get on this investment just incredible. Just in terms of, “Well now I want to know the answer.” We’ve got that student. And that’s everywhere, in applied math particularly. 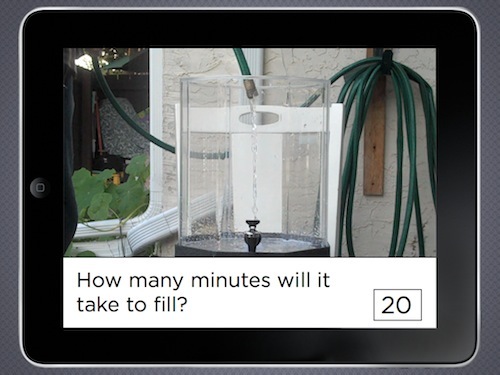 “How many minutes will it take to fill?” Every student puts down a guess before we get in the real meat of it. This is going to get really fun here. 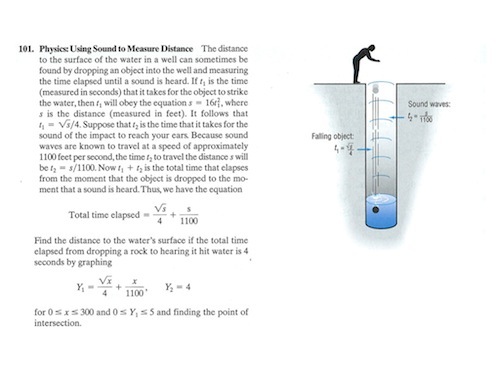 Obviously I will ask you, “How deep do you think it is?” That will happen. But even better is this. 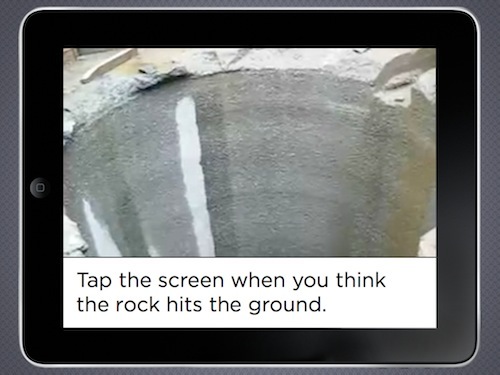 I’m going to ask you to tap on the screen when you think the rock hits the ground. And I can’t have you do that. [This part makes no sense on paper but it’s pretty awesome in the video –dm] But I’m going to ask you to raise your hand when you think the rock hits the ground. Now tapping obviously has a lot of advantages over raising your hand. It’s more surreptitious. You have your own answer. You’re less biased by others. I like that about it. But for now you saw that video before. I’m going to ask you to raise your hand up when you think the rock hits the ground. We were all over the place there. There was some large clumps there at the end. I think the you guys were late. I don’t know what the answer is, exactly, but I know that this crowd here, on that big boom, was late. Why? What was the question that these people answered perfectly? “When did I hear it?” Which is different than “When did it hit the ground?” Right. Because the sound is coming back up. And you guys should see your faces right now. Some of you guys are kind of like, “Huhhh.” So using a very low rung — which student couldn’t answer that question? 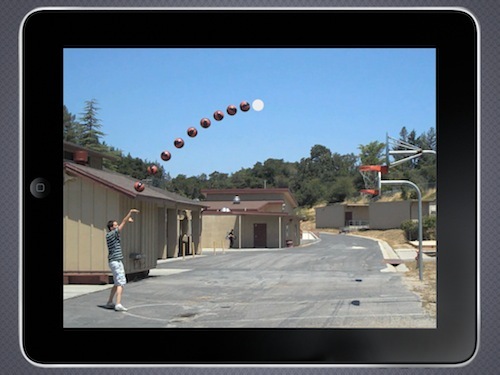 — we’ve highlighted that there’s more here than projectile motion. There’s also the speed of sound going on. We’ve got that in your head. And thinking about how that happens in print, we get a very different reaction off this right here when we’re just writing and writing and writing about the speed of sound. It’s different. This plays out in pure math in some fun ways. 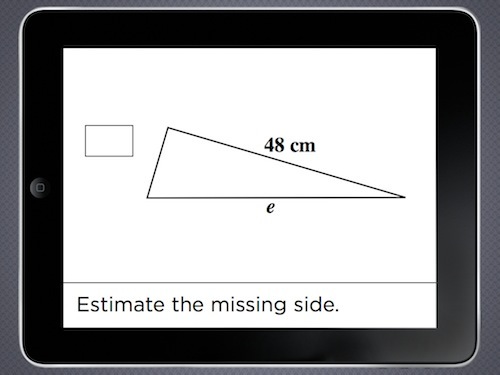 This is your very traditional trigonometry practice unit. We jump into problems like this right here. We just ask them to estimate it at the very start. All the same problems. They’re just going to see them twice, though. They’re going to go through the first time in a couple of minutes and just put down their best guess at how long that side will be. So maybe the student says, “55, maybe,” and moves onto the next one. It takes two minutes. Then the next time through, we give them this angle here. Their answer — their intuitive answer — is still up there so that when the student gets that it’ll be 49.7. Like, yeah, that’s kind of within the ballpark there. And we don’t have to answer the question, “Is that reasonable?” Their reason is staring them in the face already. So if they were to use the wrong identity. It would be more obvious. So if the student got 14, or whatever it would be, if they had solved accidentally for the other side, it might be more obvious seeing that guess staring them in the face. Hi my name is Dan Meyer and I’ve been blogging for six years. I still remember the day I set it up — just a casual decision to create a free blog. I blogged not because I wanted a huge readership but because I wanted to debrief myself after particularly good or bad lessons. I wanted to be able to read about it later. That’s it. But it turns out people like reading about that sort of thing so I slowly got a readership and even with a small one I started getting so much better as a teacher. I would ask for feedback explicitly. I would throw some praise on the people who offered critical feedback. That’s not easy to do. And the result of all that critical feedback, I’m pretty sure, is that I grew two years of professional growth for every one year I was in the classroom, which is totally unscientific there, but that’s how it felt. I’m pretty sure that without my collection of blogs and readers and critical comments, I’d still be back there totally psyched about that amazing worksheet I came up with. So give it a try. Get a blog. Write for yourself. Let other people know about it. And above all have fun. 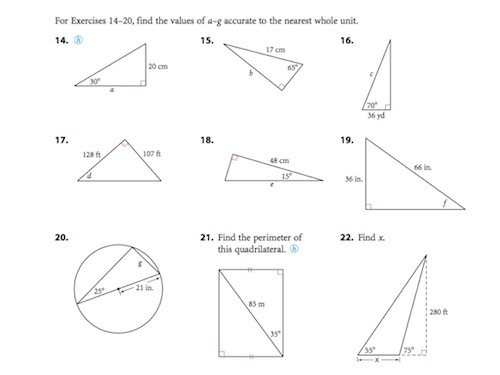 There were twenty-eight responses to the call to critique Khan Academy’s house style. My co-judge, Justin Reich, and I are debating their merits in a smoke-filled room, particularly along the “enlightening” and “entertaining” axes. We’re inviting you to weigh in on the results also and issue a People’s Choice Award. Visit this survey and give your opinion. We’ll announce the winners in a week.